Hello lovelies! I’m back again with another skincare post, because as I’ve told you guys a million times, I’m a skincare addict! If you’ve read one of my previous posts (here) then you’ll know that I recently tried out the infamous Deep Cleansing Oil from DHC. Since then, the lovely DHC team contacted me, offering me the chance to try out some more of their fabulous skincare products, tailored specifically for my skincare type. I just couldn’t resist (even though I have way too much skincare now, I really need to calm down lol), especially since they would be products suitable for my oily/combination and acne-prone skin, as often I have to turn down skincare products if they aren’t suitable for my skin. So yes, the lovely DHC team sent me some gorgeous products to try out and I’m going to share with you my thoughts on them. Disclaimer: these products were gifted to me but all opinions are 100% my own. 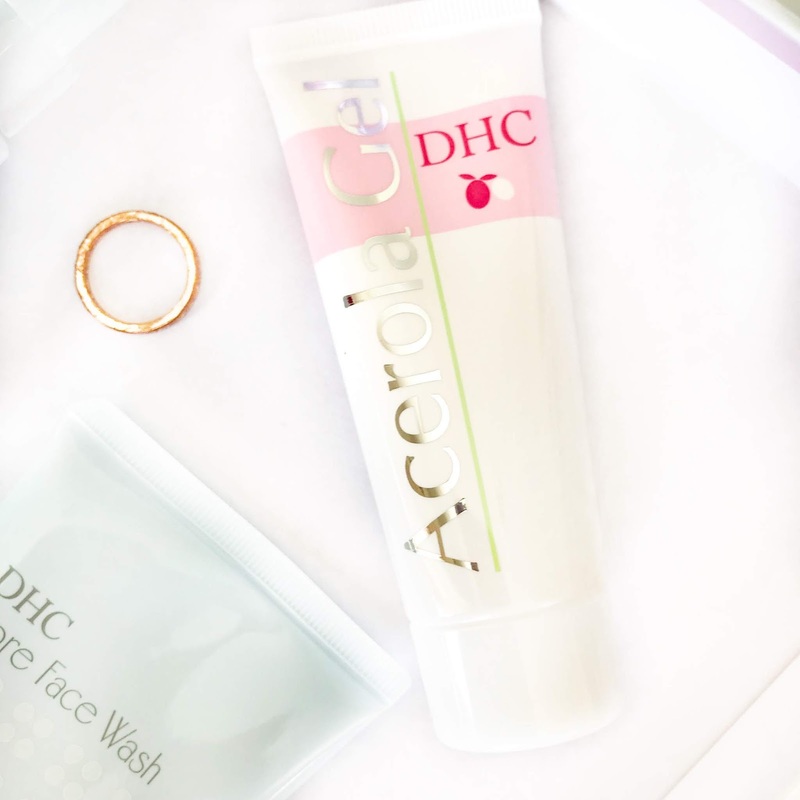 DHC is a skincare brand which specialises in Japanese beauty, meaning it offers premium antioxidant skincare. They ensure that their products contain the best ingredients, without parabens, colourants, or added fragrance. They’re also renowned for promoting the double-cleanse, through their amazing cleansing oils. The brand has really become one of my favourite skincare brands because I just adore their products. The packaging is gorgeous and simple, the products are great for sensitive skin as they don’t have any strong scents, and they just work so damn well. If you haven’t tried anything from DHC, I would really recommend trying at least one product from them, as they really are great luxurious products for your skin. So, let’s get into the good stuff: AKA: the products. As I said before, they sent me products which are formulated perfectly for oily/combination skin, so if you have the same skin type as me, these will be perfect for you! This product claims to thoroughly cleanse impurities and trapped sebum from your pores, as well as lightly exfoliating the skin without stripping it of natural oils. I love a good cleanser, so I was excited to use this Pore Face Wash. It has a very light lemony scent and has a white and creamy texture. A little goes a long way with this product (as I worked out after using a tad too much on my first use), as it lathers very easily to form a soft and creamy cleanser. The more you apply it to your face, the creamier it gets, meaning your skin feels really well-cleansed. When washing this off, my skin was literally squeaking clean and felt so lovely and soft. This is also a very gentle cleanser and I love it - perfect for a nice morning cleanse. This was a product I was very intrigued to try, as I’ve never heard of acerola before. After a quick google, I found out that acerola is also known as a Barbados cherry, which sounds amazing doesn’t it? The product is described as a ‘lightweight gel’ which ‘hydrates without causing irritation’. It is formulated with yeast and olive oil, to protect the barrier of your skin and to moisturise without clogging pores. It also says the Acerola Gel is ideal for oily and blemish-prone skin, as well as ‘combination skin in humid climates.’ As my skin is so oily, I always need a really lightweight moisturiser and gels are perfect for this. The formula is very lightweight and feels super soft when you blend it in, leaving your skin feeling matte and smooth, which is what I love. It doesn’t make my skin feel sticky or oily at all, which is perfect for me and my blemish-prone skin. As the description says, I think it would be perfect to bring on holiday as a moisturiser under your suncream or makeup as it’s so lightweight. As you guys may know, I’ve been converted to using cleansing oils to take off my makeup, so I was delighted to try this one – especially as I love the original Deep Cleansing Oil. This Pore Cleansing Oil has to be my absolute favourite out of all these DHC products. I thought I loved the Deep Cleansing one, but this one has topped it. I absolutely love the texture of this, as it feels very creamy and smooth with just 2 pumps. It’s such a lovely sensation blending this into the skin and it thoroughly removes all my makeup extremely easily. It’s said to be a lightweight cleansing oil which loosens makeup and impurities before cleansing. It contains Vitamin C which has antioxidant properties and rice bran oil which lightly conditions the skin. This Oil has a very lightweight but pleasant scent, and leaves your skin feeling so smooth when you move onto your second cleanse, making that so easy! The Pore Cleansing Oil is formulated for oily/combination skin, so it’s absolutely perfect for me. I’m going to be so sad when I’ve finished this – I’ll have to pick up another one ASAP. Another product suitable for oily/combination skin, this Pore Lotion is an alcohol-free toner with ‘pore refining properties’. It contains Vitamin C to even skin tone, artichoke leaf to refine pores, and brown algae extract to support the natural collagen in your skin. This again has the light lemony scent, meaning it feels lovely and refreshing to sweep over your skin after cleansing. I always use toner so this is a perfect one to add to my collection. It doesn’t irritate or dry out my skin – just leaves it lovely and soft, ready for moisturiser. 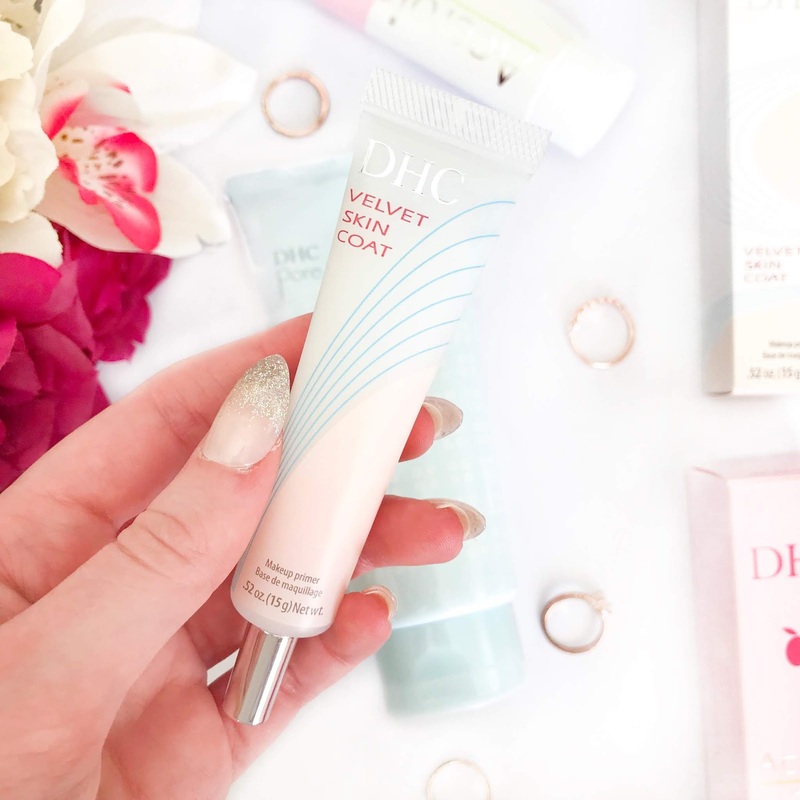 I’m such a fan of primers, so I was very excited to try this Velvet Skin Coat primer. This primer is supposed to instantly minimise fine lines, pores and imperfections while reducing oiliness, so your makeup glides on and lasts longer. This product comes out clear, like a gel formula, and sinks into the skin instantly, leaving it very smooth and matte. Again, as I have very oily skin, I love using primers under makeup or alone when I’m not wearing any makeup, to keep my skin free from oil all day. What I love about this primer is that it isn’t too drying – it still has a slightly hydrating effect, so your skin still feels soft while being kept matte. I don’t really have big pores so I can’t speak about it on that front, but it did leave my skin looking and feeling smooth and kept my skin free from oil for most of the day. And that’s it! I absolutely love all the products I received, so thank you so much to DHC! If you’re looking to try some new skincare products to try, I would really recommend anything from DHC! 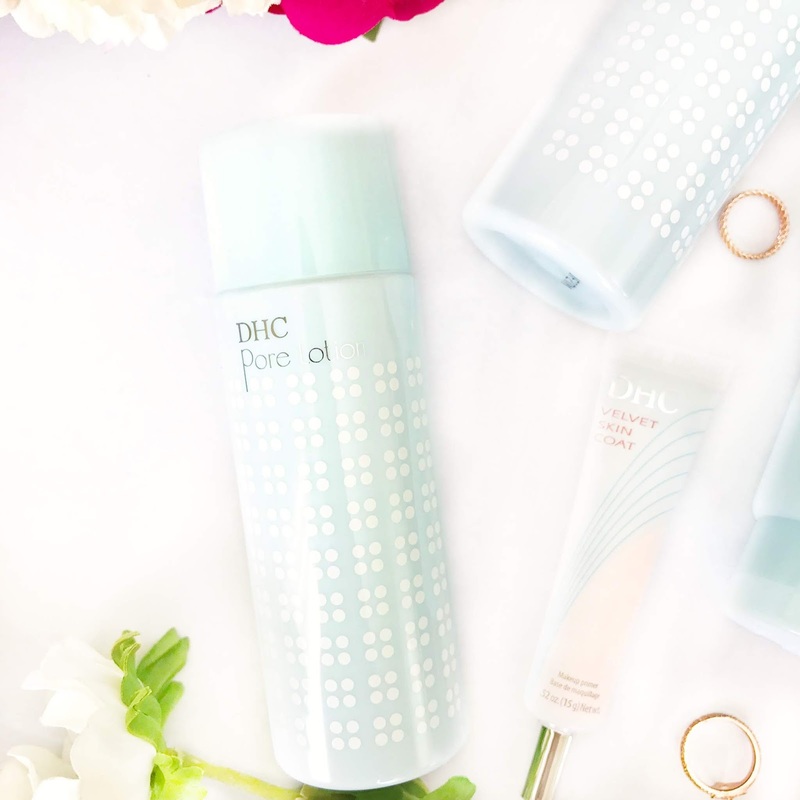 Have you tried any DHC products? I had never heard of DHC before but reading your enthusiasm about it I feel like i need to give the brand a go! loving the packaging too! These all sound absolutely amazing! I have some Japanese beauty sat ready to try that I haven't got around to yet and this has made me want to reach for it! I haven't heard of this brand, but they sound like great products. I hope to try the pore face wash soon! Skincare is so important because it sets a strong natural foundation on your face. I like that DHC has affordable skincare. I am a total fan of Asian skincare products - they seem to work with my skin XD. Pore cleansers are the best. Nothing worse than having your pores clogged. Glad you enjoyed the products :). 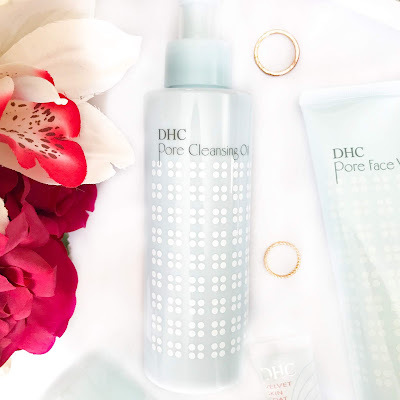 I love the DHC Cleansing Oil although I've not tried any of their other products, I would love to and after reading your post I'm definitely inspired to try out a few of their other products. I love the idea of the cleansing oil! I've personally never tried any of their products but now I really want to :3 Thanks for sharing! I've never heard of these or tried any Japanese skincare but I really would love to as I've heard a lot of fab things!